Appetite for alternative defensive allocations continues to grow as investors seek new ways to preserve capital and generate stable income. This is supported by a number of factors such as the current low interest rate environment resulting in low absolute yields, as well as recent increases in public market volatility. Coupled with this, is the general acknowledgement that fixed income return drivers have changed and inflation concerns are increasing. These factors combine to create a compelling backdrop for investors to consider allocations to the Australian private debt sector. Private debt investments (or direct lending) involve the sourcing and managing of loan portfolios that help to fill the current financing gap created by the long term decline in lending by Australian banks to Australian businesses. Australian private debt is not a new asset class, nor is it a small one. At over A$2.8 trillion, it is larger than each of the Bloomberg AusBond Composite Index, the S&P/ASX200 Index and the Australian superannuation savings pool and has been growing at a compound annual growth rate (CAGR) of 7.6% since 2003. The new and evolving aspect of Australian and New Zealand private debt is the ability for institutional investors and high net worth individuals to access a larger portion of this market that historically has been the domain of banks. Despite its relative size, Australian private debt has not experienced the same degree of institutional participation as has been experienced in other markets. The Australian private debt market has largely been dominated by domestic and to a lesser extent, offshore banks. 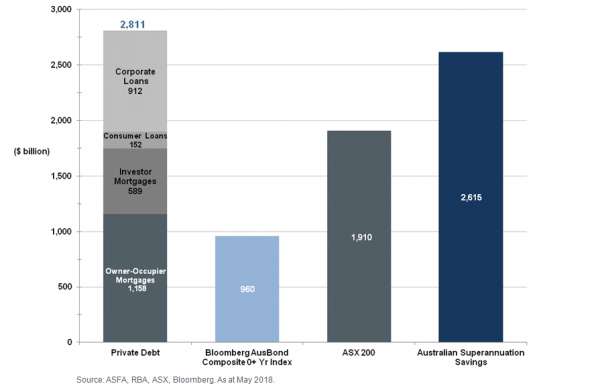 Thus far, Australia’s largest banks have traditionally held a significant proportion of the private debt market on their own balance sheets and financed this with a combination of deposits and issuance of their bonds in domestic and global markets. In this way, the private debt market has almost been entirely intermediated by the big four Australian banks, with the only meaningful way for institutional investors to gain exposure to this space being through the purchase of bank issued bonds – which is an indirect and levered exposure. Why is it gaining popularity now? There are permanent structural and regulatory changes already underway in Australia which are leading to this current situation changing rapidly. Overseas in the US and Europe, private debt markets are much more accessible with a great deal of competition, about 90% of the market participation is institutional. The local private debt market is expected to follow the lead of other developed offshore markets and open up a significant opportunity for domestic institutional and high net worth investors. The effect of key announcements by APRA (Prudential Standard APS 120 Securitisation – announced in 2016 and came into force on 1 January 2018) has had significant impact on the four Australian banks. Given approximately two thirds of the big four banks’ balance sheets are composed of mortgages, there has been a dramatic increase in the capital required to support this activity. This has had the effect of ‘starving’ other areas of capital required to support lending activities attracting higher capital charges due to the rationing of a finite capital base. As a result of these regulatory changes there is now a significant opportunity in the Australian private debt market, where the banks have been forced to retreat and where institutional investors have emerged to fill the void. In looking at the spectrum of what is included in the private debt universe, the most attractive sub-sectors (identified against the current market backdrop) include leveraged buyout and private company debt (examples include Primo Smallgoods, Ticketek and Boost Juice), private and public Asset-Backed Securities (ABS) and loans to stabilised commercial real estate assets. The relative attraction of these sub-sectors is driven by numerous factors, such as their size and the relative value on offer. What role does it play in portfolio construction? From a portfolio construction perspective, Australian and New Zealand private debt exhibits several compelling characteristics. Most notably, it is not correlated to traditional asset classes and offers true portfolio diversification – offering investors exposure to sub-sectors, industries and companies that are not generally accessible, and provides diversification away from financial sector risk (where portfolios may have exposure through shares, hybrids and corporate credit). Being floating rate and largely illiquid, private debt also exhibits lower volatility and stable returns, which results in a superior Sharpe ratio when incorporated into a portfolio of Australian equities and fixed income. Importantly, quarterly or monthly (in the case of ABS) coupons, provide portfolios with regular income streams, while their floating rate nature provides protection from inflation and future interest rate increases. As the Australian private debt investment universe is large with low levels of institutional investor participation, and with certain sub-sectors offering strong relative value, it is an asset class that will continue evolving and gaining investor interest. This information has been prepared by Revolution Asset Management Pty Ltd ACN 623 140 607 Authorised Representative No: 1262909 (‘Revolution’). Although every effort has been made to verify the accuracy of the information contained in this document, Revolution, its directors, officers, representatives, employees, associates and agents disclaim all liability (except for any liability which by law cannot be excluded), for any error, inaccuracy in, or omission from the information contained in this document or any loss or damage suffered by any person directly or indirectly through relying on this information. The information in this document is not financial product advice and has been prepared without taking into account the objectives, financial situation or needs of any particular person. All investments involve risk. Past performance is not a reliable indicator of future performance. Reserve Bank of Australia (RBA).